iSketch from CCC Development is a simple doodling app for the iPhone and iPod touch. Unlike more advanced painting apps like Brushes or Layers, iSketch keeps it simple and sticks to the basics. 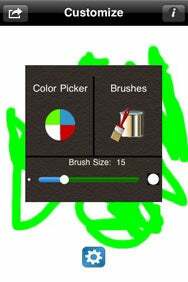 Keep It Simple: iSketch gives you five brushes and a color picker that lets you choose virtually any color imaginable. There are five different brushes you can paint with—a soft round brush, flat brush, air brush, and two other speckled brushes. There’s also an eraser. You can adjust the size of these brushes from five to 50 pixels in diameter but there’s no way to change the transparency. One feature of iSketch not usually found in painting apps is the text tool, which allows you to type in your text, adjust the font size and then place it into your painting. Once placed, you can drag the text around the canvas with one finger or use two to rotate it. Unfortunately, there’s no way to choose different fonts or even the color of the text. Also, one it’s set in place, the text is no longer editable. The color picker in iSketch is a complete HSV/RGB/HEX spectrum, so you can choose virtually any color imaginable and adjust its lightness and darkness with a slider. You can also select a color from one of the 30 preset color swatches if you prefer. iSketch’s interface is well designed and easy to use. To access the brushes and other tools, you just tap a little gear icon at the bottom of the screen and then tap it again to hide them. As I mentioned above, iSketch is a very basic painting app. You won’t find an undo button, layers, transparency settings, or even the ability to zoom in and out of your painting. iSketch has the ability to e-mail or save your creations but only at the native iPhone resolution of 320X480. The only thing that’s really outstanding about this app is the fact that it was created by an 11-year-old boy who taught himself to develop applications for the iPhone. His name is Cameron Cohen and he has pledged to give a portion of the proceeds to the Mattel Children’s Hospital. If you’re looking for a simple doodling application iSketch may work for you, but if it’s serious image editing/painting you want to do, you’ll need to look elsewhere. The $1 purchase price is worth it just to know your helping a good cause, though.